While most of us use language in some form every single day, it’s relatively rare that we consciously decide to invent language – that we sit down with the intention of creating a fully fledged tongue, complete with vocabulary, conjugation, pronunciation, derivation, inflection and orthography. This, however, was precisely what J. R. R. Tolkien, author of works including The Hobbit, The Lord of the Rings, and The Silmarillion, set out to do when he constructed the Elvish languages of Middle Earth – the world he created as the backdrop to his stories and as the home for his languages. The Tolkien: Maker of Middle-Earth exhibition at Oxford’s Weston Library provides a glimpse into the rich linguistic universe Tolkien both crafted and occupied. Visitors are instantly met with Tolkien’s linguistic flair in the form of a life-size projection of the Doors of Durin, complete with Elvish inscription, welcoming them to the exhibition space. Lord of the Rings fans will be well familiar with this gateway as the entrance to the dwarfish Mines of Moria – and the translator in me couldn’t help but think how lucky the Fellowship were to have a wizard fluent in the Elvish language of Sindarin to help them translate the cryptic password! This scene alone encapsulates how fundamental Tolkien’s languages were to the very fabric of his imaginary world, and, indeed, allows us to reflect on the importance of translation in our real one. As the inhabitants of Middle Earth relied on translation to gain access to paths that would otherwise have been barred to them, to negotiate with one another and to make new friends, so too do we rely on translation between languages in much the same way. It wasn’t just in the creation of languages, though, that Tolkien gave expression to his linguistic creativity. A doting father, Tolkien would write letters to his children every year under the pen name Father Christmas, delighting them with stories from the North Pole. A particularly dramatic extract is featured in the exhibition, describing the time when Father Christmas’ trusty aide, the North Polar Bear, becomes trapped in a cave inhabited by goblins. Tolkien was equally innovative when it came to drafting his stories, making use of whatever was to hand to scribble down his thoughts, including unused examination booklets from the University of Leeds, where he taught English in the 1920s. This kind of outpouring of ideas onto any available surface is equally reflected in the doodles he would pen across the surrounding newspaper articles as he completed the daily crossword. Documents like these provide a unique glimpse into the inner workings of Tolkien’s mind and the processes he relied upon during the composition of his works and of his words. Tolkien was a wordsmith in the fullest sense, both as a “skilled user of words”, as defined by the Oxford English Dictionary, as well as a contributor to this very dictionary himself. He worked on the original OED as an editorial assistant from 1919 to 1920, contributing a number of definitions and etymologies for words beginning with W, including walrus, waggle and walnut. And, of course, many of Tolkien’s own coinages have made their way into the dictionary too, notably hobbit (“A member of an imaginary race similar to humans, of small size and with hairy feet, in stories by J. R. R. Tolkien”) and its derivative hobbitry, mithril (“In the fiction of J. R. R. Tolkien (subsequently adopted in other fantasy contexts with reference to Tolkien): a rare silver-coloured precious metal of great hardness and beauty”) and the delightful eucatastrophe (“A sudden and favourable resolution of events in a story; a happy ending; first recorded in a letter by J. R. R Tolkien, who apparently coined the term”). While we may not tend to coin new words on a regular basis in our own linguistic interactions, we all know that there are ways that we too can use language creatively to have a particular effect on our readers and listeners. For us as translators, the purpose of a particular text is something we have to think about constantly, and we have to adapt the language we use in our translations to it, which sometimes means coming up with some pretty imaginative solutions. Creative language use, then, is by no means restricted to the creative writer or the journalist; it’s something we’re all free to tap into every time we open our mouths, or pick up a pen, or make a gesture. And who knows – perhaps one day, constructed languages like Tolkien’s will be offered in translation courses too! 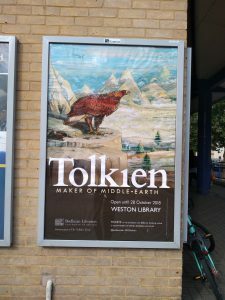 The Tolkien: Maker of Middle-Earth exhibition can be seen at the Weston Library in Oxford until 28 October.